This is my go-to dessert whenever I have a brain freeze and can't think of anything else to make. It's so easy, and yet at the same time looks like it took a bit of effort to put together. 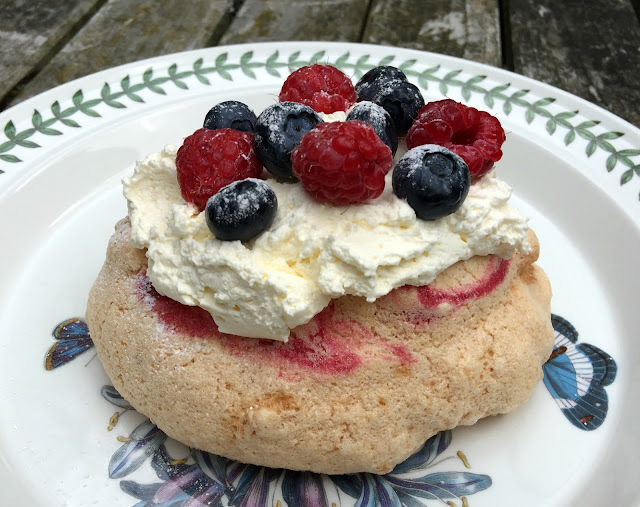 For me it's the perfect dessert when the soft summer berries are in season. 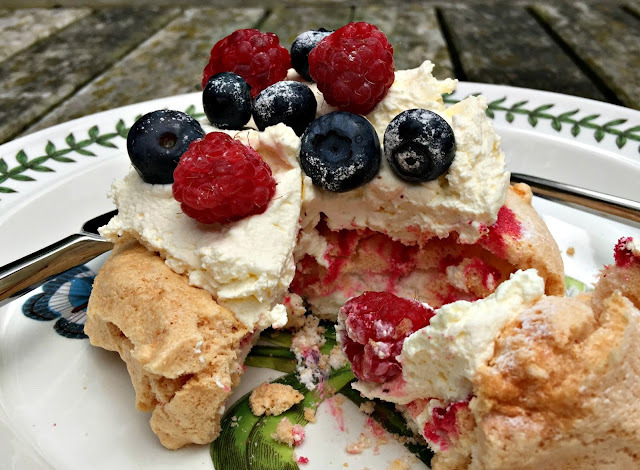 The sweetness of the meringue needs something slightly tart to cut across it and balance the flavours. In my book a mixture of alpine strawberries, raspberries, and blue berries would be a pretty perfect accompaniment, but you can add whatever works for you. Take 4 eggs out of the fridge and leave them on the worktop until they come to room temperature. 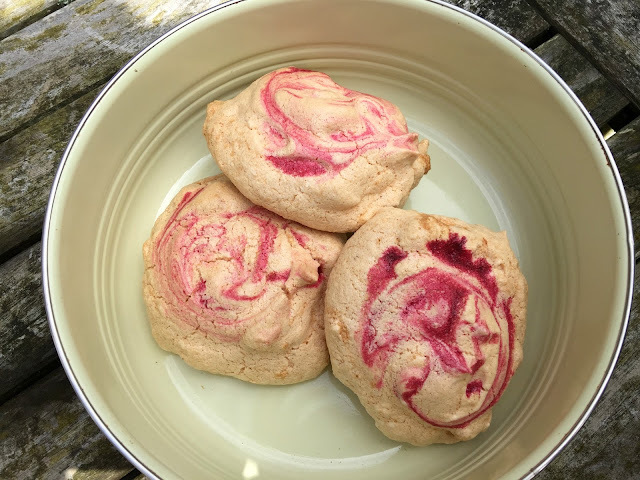 Heat your oven to 160 º C/ 315 º F.
Line a baking tray with greaseproof paper, and draw either one big (dinner plate sized) circle or 8 smaller (ramekin sized) circles on the paper, which will form the templates for shaping your meringue(s). Break the egg whites into a perfectly clean mixing bowl. Be careful to not have even a trace of grease as this will affect how stiffly you can beat your egg-whites. Beat the egg whites until they are glossy and form stiff peaks. You should be able to tip your mixing bowl upside down without them falling out, and the air bubbles should all be small and evenly distributed. Using a metal spoon gently fold in the sugar, sifted cornflour, vanilla essence and vinegar. Mix gently to a uniform consistency. Don't overdo it on the mixing or the mixture will become grainy. Now spoon your mixture onto the baking paper to form either one large meringue or 8 smaller ones. Using your spoon and a spatula shape them into the shapes that you'd like them to have. Drop a single drip of red food colouring onto the top of each meringue, and then tease it out into swirls of colour using a skewer. 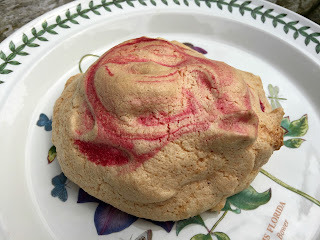 If you go down the one large meringue route you may want to use a few more drops of food colour, but don't go in too heavy-handedly or the swirls will coagulate into large lumpen blood-clots. Place the meringue(s) into the oven and bake for 1 hour. Then turn off the oven and leave them inside to cool down. Don't take them out until they've come to room temperature. This slow cooling will help prevent your meringue(s) from cracking. When the meringue(s) have cooled down, decorate with whipped cream and fruit. I shake of icing sugar, sifted gently through a tea-strainer helps complete the presentation. If you can't use all of the meringues at once they will keep for several weeks in an air-tight tin, which makes them a great resource for any impromptu, last-minute supper parties. One thing I've noticed is that I can't get the meringues to crisp when I'm in Spain in the middle of summer. We live by the beach and it gets really humid as the mercury rises. They come out of the oven nice and crisp, but in virtually no time at all they've started to go soggy. So if you're dealing with very high levels of humidity these babies may not be an unqualified success.